Their favourite surfing spots were Trestles at San Onofre State Beach in San Diego County, and T-Street in San Clemente although possibly they were there at different times in their lives. Fun to think that Tom and Ron’s paths might have crossed way back then and now many moons later, they’ve converged again and the two are living just down the road from each other, in Summerland. Ron and Tom originally met in 2001 and until last month’s Chardonnay tasting for this magazine, hadn’t seen each other for ten years. 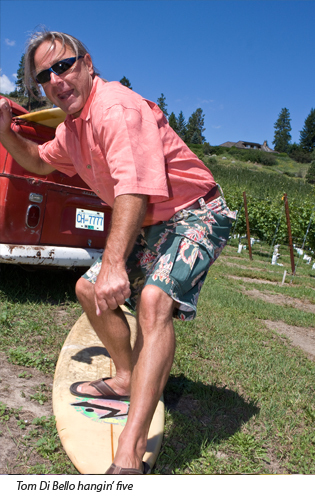 Back in the early 2000′s they shared a passion for making the best Pinot Noir in the Okanagan. “We had some of the best wine in the country but people couldn’t pronounce Scherzinger so when we changed the name to Dirty Laundry – then it took off – we had the wine, the story and the name and that made it go wild.” says Watkins. Ron and Cher sold the winery a few years ago. It is still one of the hottest commodities in the Okanagan wine business. Ron and Tom give credence to the oft-quoted belief that wine reflects the character and personality of the winemaker. 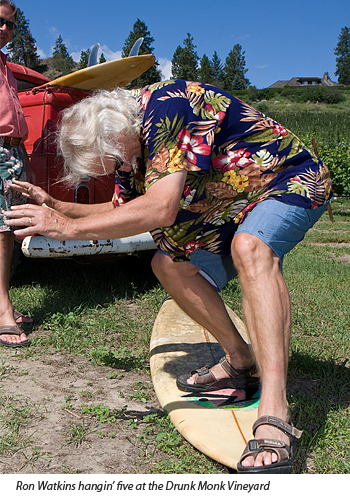 And if the character of the winemaker comes through in the wine, much like surfing – the bottom line is in the balance. The wine labels on the Di Bello wines perfectly express the Di Bello story: “Our wines are made with uncompromising quality that offers the purest expression of their origin. We cherry-pick special vineyards which express their terroir and match the varietal.” On their 2011 Merlot, the Di Bello label states, “Don’t expect a blockbuster over-ripe tannin machine from this, expect a subtle, elegantly structured wine, a very pretty and powerful feminine style Merlot.” It’s true. It’s a beautiful wine… and it’s also moreish. There’s nothing pretentious about either Ron or Tom’s approach to wine. 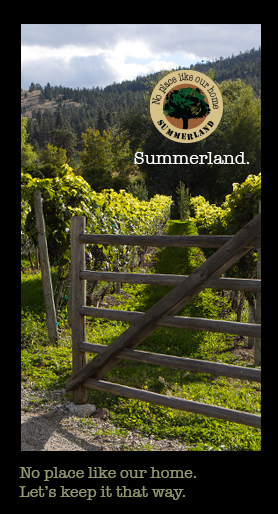 They both say, like many in the Okanagan who know wine – what you like is all that matters. In surfing terms, ‘splitting the peak’ means two surfers go for the same peak but split it with one going left and the other right. 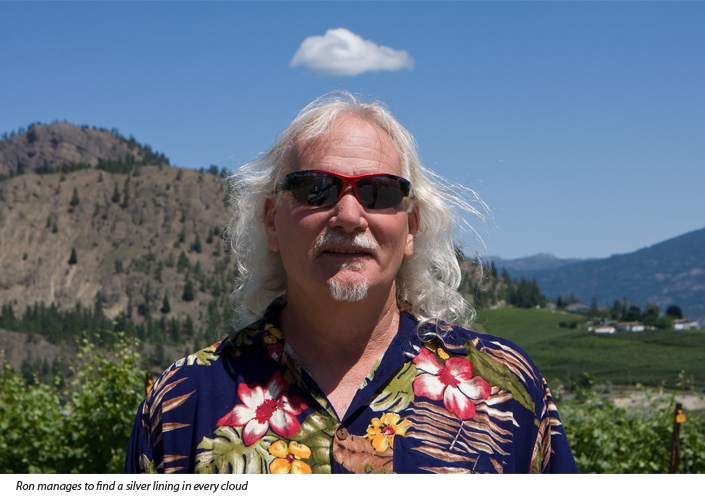 Tom Di Bello announced last week that he had just accepted the position of winemaker at Burrowing Owl, one of the finest wineries in the Okanagan. With Ron starting up the new vineyard, both have their foreseeable futures mapped out for them, albeit on very different roads. It would seem that there is no wiping out for either of these two who have apparently limitless forward momentum balanced nicely with a zen mastery of the bumps and rough currents of life. Ok, so that maybe sounds somewhat like a suspect wine label description, but if you met them, you’d know it’s not way off base. You could even say that Ron and Tom were “Aged a minimum of 55 years, both have good legs and each is a blend of several different years peaking into maturity and taking on a rich red color and fruit forwardness after being left on the wood for too long.” Or you can just say they are really gnarly dudes stoked for what the future is promising. 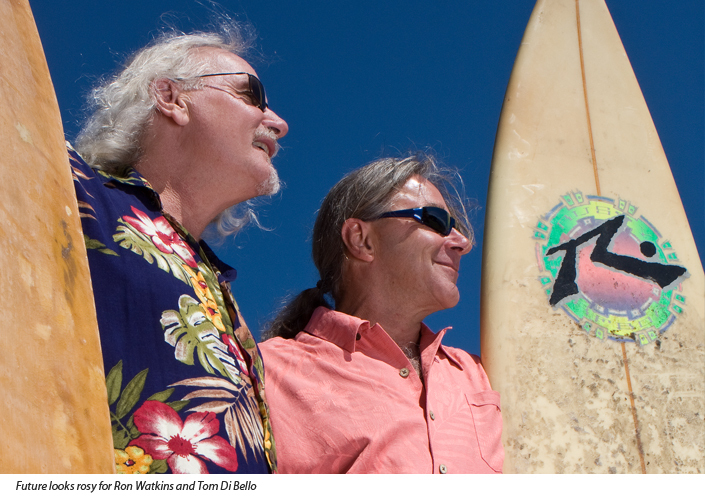 Either way these two soul surfers are likely to keep on catching big ones and hangin’ loose… until they just get board. 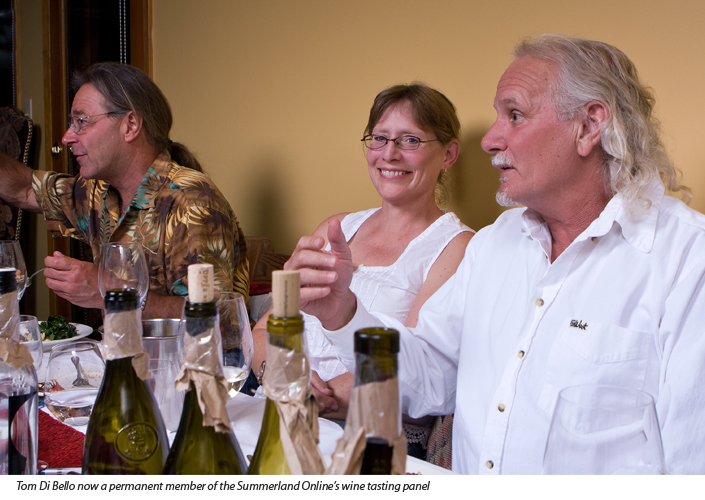 Tom is a welcome addition to our blind wine tasting panel. And Tari, his other half is known to be a fabulous cook and has offered to pitch in on the culinary side. Epic.